There were three stories that seem to come together that I've read recently. First is an article about Holon's Women's Festival, that quotes from Virginia Wolf, "A woman must have money and a room of her own if she is to write fiction" (1928, A Room of One's Own). This quote seems to relate to another story that is about the general harassment and threats that women are receiving on the web. According to an article by Ellen Nakashima of the Washington Post this problem is on the increase. Aslishlomontl's blog points out that this same rise in behavior in chat room environments lead to a reduction in women in chat rooms over 2000 to 2005. The question is what do we do with this understanding? Robert Scoble, technology blogger, is quoted in Ellen's article that if women chose to stop participating it will lead to negative impact on career prospects, "If women aren't willing to show up for networking events, either offline or online, then they're never going to be included in the industry," he said. Don't misunderstand him, he's a fan of our participation. If you play games, you're a gamer chick. Whether you're an Xbox Halo 2 champ, play RPGs on the PC, or Mah Jong Tiles on MSN Games, you're a gamer chick. Xbox GamerchiX don't talk trash about other women. Ever. When women stop hating on each other … we will rule the world! Xbox GamerchiX support each other. 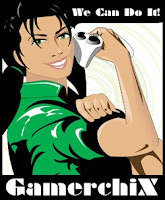 Xbox GamerchiX are good role models for young gamer girls. GamerchiX are not pin-ups. We're all hot in our own unique way, but it's about the games and the companionship, not T&A. You can be a member of any clan or group, but while you're part of GamerchiX, you don't talk trash about other gamers. The quote from Virginia is still basically true, but may be instead of money it's technology and a room is a space free from criticism. There are so many ways that technology can facilitate letting out our creative spirits. We have to continue to be creative in keeping these 'rooms' free of over abusive headaches so we can achieve our goals. As technologies and businesses are created how can we maximize keeping a positive environment and not tolerate inappropriate anonymous behavior, or provide support to increase our resolve to continue to participate when the going gets tough.